You can also check out my other non-comic related art on my deviantART account. In an anachronistic universe, where science meets sorcery and elves meet cigarettes (? ), Nikolan has been given the task of warding away colossal predators and the occasional genocidal faction away from the 'civilized' ever since he could barely hold a blade. He isn't considered professional in his field but with the team of his own consisting of a mysteriously talented Dr. 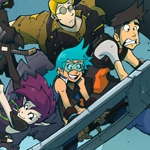 Eight and a mad-mannered elf nicknamed Axe, they get to share the blame equally for any job botched. Sure the work hours are irregular, the pay is laughably meager and most of the effort includes unhealthy doses of running for your life and relying on your luck but at least it would make one heck of a dinner-party story to tell.